The Wireless Touch Speaker BoomBox has just arrived with a no-wires approach that plays the music when your smartphone touches the speaker. The Wireless touch Speaker BoomBox rids of all wires and brings a simple approach to speaker systems. All you have to do is touch your smartphone against the speaker to hear amplified music. BoomBox features new audio technology called NearFA that's compatible with all iOS and Android smartphones, MP3 players, and other small devices. Other specs include 3W speakers with a 100Hz-20KHz rating output, as well as a 3.5 mm jack input and 3.7V 850mAhlithium ion battery. 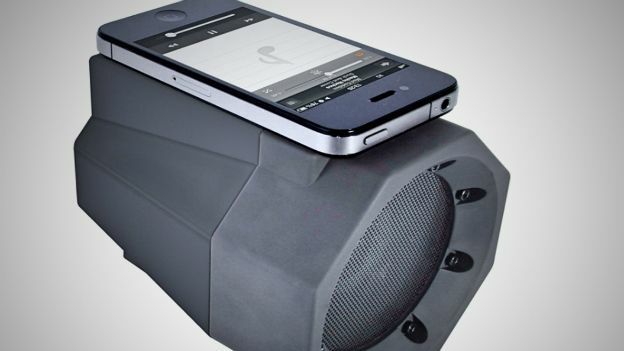 A single charge will power the BoomBox for over 10 hours. "There's no need to go through a complicated Bluetooth or wireless setup routine before you can start using the speaker, all you need to do is to turn the speaker on, start the music playing on your phone and then place your phone on top," explained the manufacturer. The Wireless Touch Speaker BoomBox retails at £24.95 and is available online at Gizoo, Amazon, and eBay.